The granulocyte-macrophage progenitor cell (colony-forming unit culture, CFU-c) can be detected by its ability to undergo clonal proliferation in semisolid medium when provided with stimulatory macromolecules operationally termed colony-stimulating factor (CSF) (3, 26, 35). A similar if not identical class of molecules also stimulates the proliferation of a precursor cell solely committed to macrophage differentiation, the colony-forming unit-peritoneal macrophage (CFU-pm) (21, 23). The principal cells capable of elaborating CSF have been identified as the monocyte (7, 29) or tissue macrophage (11, 14, 29), and therefore the control of granulopoiesis and macrophage production has been postulated to occur through a positive feedback involving the action of CSF on the two hemopoietic progenitor cells, CFU-c and CFU-pm (21, 27). 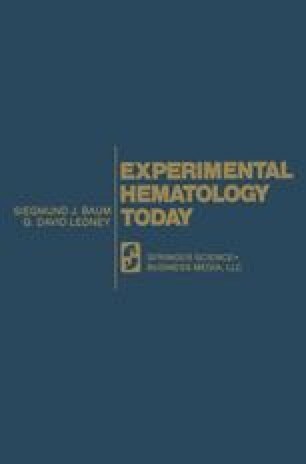 The requirement for CSF of both the CFU-c and CFU-pm, and the inability of CSF to influence the clonal proliferation of two other hemopoietic cells capable of growth in soft agar (the B-lymphocyte colony-forming cell and the murine myelomonocytic leukemic cell line, WEHI-3 (38)), suggest cell-type specificity of this regulator of in vitro granulopoiesis (21). However, it is becoming increasingly apparent that the control of steady-state granulopoiesis and the response of the system to perturbation cannot be accounted for solely on the basis of variations in CSF levels, and that possible inhibitory influences may play an important role in counteracting the proliferative stimulus of CSF.